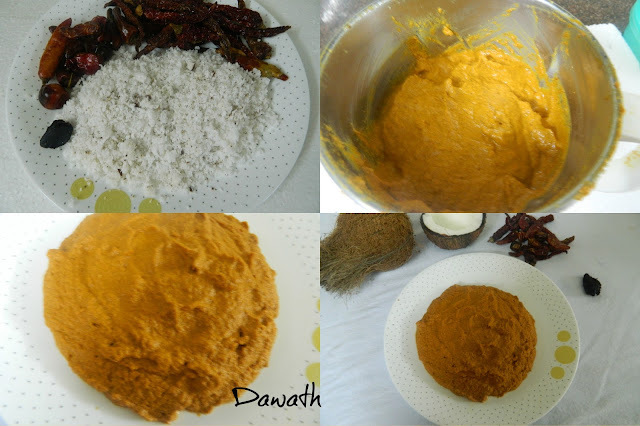 This is the basic Konkani masala which we use in almost most of our gravy preparations.Coconut is the main ingredient and we Konkani s consume coconut very often. I will give this link of basic masala as and when required . Grind all the ingredients to a very fine paste. I grind the masala in the grinder if it is large quantity and especially for the seafood preparation. You may adjust the coconut gratings and chiilies as per the dish. We prepare several dishes using this as the base masala. We also fry the long and short red chillies in oil and store it. To fry long chillies just heat some oil in a wok and roast the chillies until crisp. Dont add too much water while grinding masala.